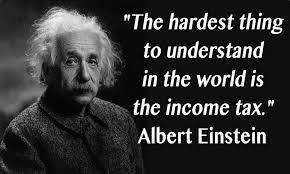 If Einstein thought it was hard why aren’t you getting expert help? We know most of you would rather do anything else before you do your taxes… shopping, footy or even clearing out the gutters. We know this because many of our clients tell us that dealing with their taxes is the thing they dread most. That’s why you’ll be pleased to learn that at The Wealth Centre we’ll make your taxes so easy you will completely lose that feeling of utter dread. Imagine … the thought of ‘doing your taxes’ doesn’t make you feel sick! 3. Then you have access to our fully qualified Accounting Team. A team with extensive real world experience in accounting, personal and business tax, and most importantly, the ability to communicate. Our Accounting team specialise in all matters related to tax (both personal and business). So no matter how big or small, or the stage (or hole) you’re at right now, we can help you. Get rid of the dreaded TAX task that awaits you and call us for help. Remember the ATO is now handing out hefty fines for late submissions… they know people do all they can to avoid doing tax returns and are doing all they can to force you to do them. Call The Wealth Centre on 1300 132 648 or contact us today and we’ll get in touch within two business days to help you.